Similar to kilowatt, it is a means of measuring electricity, only that it is utilized to convey the amount of energy being used by a household over a period of time. For example, a kilowatt is equal to 1,000 watts of electricity. Let’s say a 1,000 watt drill needs 1,000 watts (1 kW) of power to make it work, then you’re using 1 kWH of energy in an hour - if that drill stayed on for an entire hour. In other words, a kilowatt hour (kWh) is a measure of how much energy you consume. It doesn’t mean the number of kilowatts you’re using per hour, it equals the amount of electricity you’d use if you kept a 1,000 watt device running for an hour. Conversely, if you use a 50 watt light bulb, it would have to stay on for 20 hours before it used 1 kWh. Now, the average U.S. household uses 10,400 kWh of electricity each year. If you break it down to a monthly figure, it comes to about 870 kWh per month (30 kWh per day). 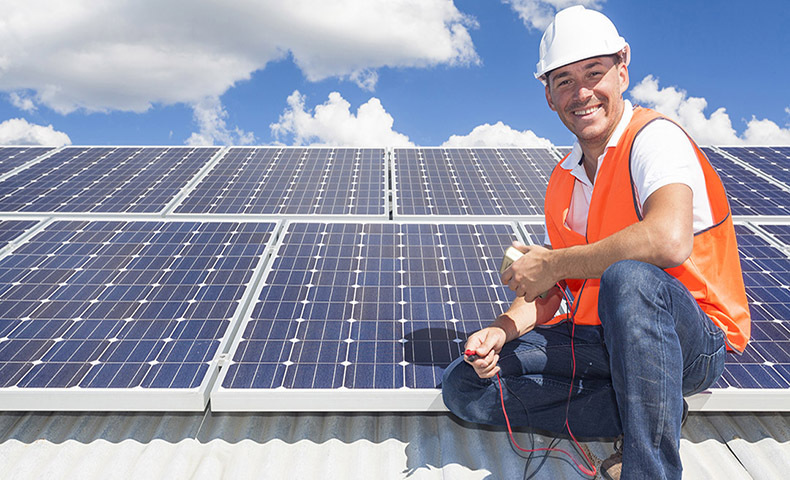 When installing solar panels in your home, it’s important to know your individual household energy needs - and the solar energy company you hire should be able to determine this by looking at your electricity bills. Knowing that figure will determine how many solar panels would support your electricity needs. You also have to account for other factors, such as the number of sun hours per day and other weather-related aspects in your location. Sun-hours refers to how much sun you get each day where you live. You can find that info on the Department of Energy’s NREL Solar Maps website. A sunny, hot location in the southwest generally receives more direct sunlight than a home in the Midwest. In general, a solar panel generates 250 watts of power when the sun shines on it. If you estimate that the sun is hitting that solar panel 5 hours per day, for 30 days (5x 250x30) , they will be producing 37,500 watt-hours per month (which divided by 1,000 gives you 37.5 kilowatt hours (kWh) of electrical output monthly. That’s barely enough to power some small appliances. This measure is also how your utility company will explain your energy use in your bill. Now that you have this figure, you can start multiplying it until you get close to what your monthly energy needs are. Solar panels will have a number listed on the back that indicates how much power they will put out during peak conditions. That should give you a guide as to how many you need. For instance, if an average home uses 870 kWh per month (as noted above), that means you will need approximately 23 solar panels to service that home (870/37.5). Of course, these are rough estimates, and a knowledgeable solar installer will give you a more accurate quote. You can also check our Price Checker to estimate the size of system you need based on your location. Something else to factor when thinking about installing solar panels is how your life would change in the next 20-25 years (the average lifespan of a solar energy system). Say for instance, if you will be adding to the family, or if a teenage daughter is about to head to college in the next three years. Those circumstances will mean higher or lower electricity usage in the future. Similarly, if you plan to purchase an electric car you’ll be charging at home or a hot tub to relax in your backyard. Also, you need to determine how much of your power do you want to come from solar. Whether it’s 50% or 80%, the figure will be equally important to determine your energy needs. After you start a process with a solar installer and they review your electricity output goal, they will give you a quote explaining this with a design for your renewable energy system. You may also take a few minutes to design your own perfect solar array by imputing some basic information about your home and energy needs. Check the price of solar panels in your area in a matter of seconds!